The MSI WS60 is a fast mobile workstation, but one that sacrifices stamina for pure power. With a high entry price tag and some usability quirks, there isn't much that sets the WS60 apart from the competition, and you may find a more balanced machine elsewhere. Mobile workstations pack plenty of raw performance under the hood, but often come in thick, boxy designs. This is only half true of the $2,299 (£1,550, AU$3,035) MSI WS60, a mobile workstation that takes its inspiration from slim, sleek Ultrabooks. MSI is marketing the WS60 to designers, claiming that it is the "best laptop for CAD & 3D modeling." With the performance to back it up, the sleek brushed metal design of the WS60 gives the notebook a lot of desk appeal when compared to competing mobile workstations, making the WS60 feel right at home in a designer workspace. With a 15.6-inch display, competitors to the WS60 include the Dell Precision M3800 at $2,234 (£1,505, AU$2,862), Dell Precision M4800 at $2,079 (£1,400, AU$2,665), HP ZBook 15 G2 at $2,999 (£2,020, AU$3,845), Lenovo ThinkPad W550s at $1,133 (£765, AU$1,455) and Lenovo ThinkPad W541 at $1,232 (£827, AU$1,613). For a larger screen size and an even more powerful graphics chip, the 17-inch HP ZBook 17 G2 is an excellent alternative. Those who prefer to live within Apple's ecosystem can also choose the $2,499 (£1,685, AU$3,205) MacBook Pro 15-inch with Retina display. If the power of mobile workstations makes them analogous to pickup trucks, then the sleek metal trim of MSI's WS60 gives it the sheen of a sports car. And nowhere is this more true than on the lid of the WS60. Unlike the ThinkPad W550s's boxy utilitarian design, the WS60 is cloaked in a black, brushed metal shell. The laptop's lid showcases the MSI logo and a shield emblem with green insets. The shield and the lid's contouring are reminiscent of the aerodynamic hood of a Lamborghini. Most competing workstations with the WS60's power are both heavier and thicker than MSI's brushed metal design. The Dell Precision M4800 is 2 pounds (0.91kg) heavier that the 4.36-pound (2.78kg) WS60, weighing in at 6.36 pounds. 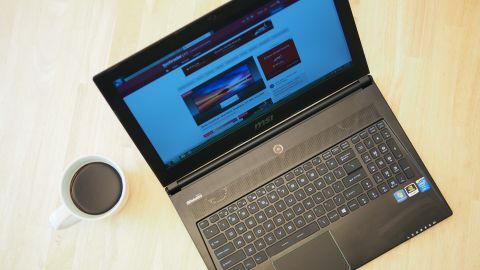 HP's more compact ZBook 15 G2 is a little lighter than the Precision M4800 at 6.13 pounds (2.78kg), but is still considerably heavier than the WS60. The added weight really makes a difference for road warriors and business travelers. I find the weight of the WS60 more manageable when carried in a shoulder bag all day. These rivals are also thicker than the 15.35 x 10.47 x 0.78-inch (38.99 x 26.59 x 1.98cm) measurements dimensions of the WS60. The Precision M4800 has a 1.37-inch (3.48cm) thick body, while the ZBook 15 G2's frame comes in at 1.2 inches (3.05cm) thick. Dell's sleek Precision M3800, a mobile workstation that borrows its premium, tapered design from the company's flagship XPS 13 Ultrabook, comes closest to WS60's dimensions, weighing 4.15 pounds (1.88kg) and carrying a thickness of 0.71 inches (1.8cm). Apple's 15-inch MacBook Pro with Retina display is similarly portable at 4.46 pounds (2.02kg) and 0.71-inch (1.8cm) thin. The black brushed metal case does a decent job repelling dirt and fingerprints, unlike the rubberized coating on the lid of the ThinkPad W550s. However, I found that compared to the silver metal of the MacBook Pro or the matte carbon fiber shell of the $949 (£645, AU$1,255) ThinkPad T450s, the black paint does a terrible job of concealing oils from your skin. Also, unlike the solid unibody metal construction on the lid of the Precision M3800 and the MacBook Pro, I noticed quite a bit of flexing when pushing on the lid or even when opening the laptop by just grabbing a corner of the lid. The hinge where the lid is attached to the WS60's body is constructed of plastic. Although I encountered no issues with the choice of material here, the hinge doesn't feel as sturdy when pressed compared to the MacBook Pro or the Lenovo ThinkPad W550s. Opening the lid reveals a capacious 15.6-inch matte display. MSI offers options for full HD 1080p resolution as well as 3K, but neither choice will give you a touchscreen. The brushed metal finish continues on the laptop deck, but MSI uses a plastic composite material for the undercarriage. An array of bright, white LED lights adorn the front right side of the laptop. The lights quickly notify users about the state of the laptop, along with connectivity status. Even though the lights are visible when the lid is closed, I had to open the lid to determine what they mean, as the identifying symbols are printed on the edge of the keyboard dock, not on the front of the laptop. Although there are plenty of ports on both the left and right sides of the WS60, there isn't a mechanical docking connector on the undercarriage like on the ThinkPad W550s and W541. This means that unless you buy a separate third-party hub, you're limited to the three USB 3.0 ports on the laptop. The good news is that there are dual digital video output ports so you can drive two displays straight from the WS60 via the on-board HDMI and Thunderbolt (mini DisplayPort) ports. The WS60 houses a keyboard designed by SteelSeries. The programmable backlit keyboard comes with blue lighting and stylized fonts to identify each key. Like the keys on the MacBook Pro, the keys on the WS60 are flat and not concave. Although there is decent key travel - the WS60 keyboard offers more travel than a MacBook Pro keyboard, but less travel when compared to the Lenovo ThinkPad W550s - the keys feel stiff and less springy, compared to the MacBook Pro, when pressed. I found the keyboard comfortable, but I still preferred the MacBook keyboard for its springiness. Lacking the loud clicking noise of the MacBook keyboard, the keys on the WS60 are quieter when typing, and I noticed that certain keys on the keyboard are stiffer than others. Additionally, I noticed that when I am typing hard and pushing down on the keys, the keyboard deck flexes a little, a phenomenon that's not present on the ThinkPad T450s or the MacBook. For those who work a lot with numbers, a dedicated number pad sits to the right of the keyboard, a feature typically reserved for business-class workstations and notebooks. Although a dedicated number pad offers instant utility when working with financial spreadsheets, the narrower width of each key, compared to a dedicated desktop keyboard, made it difficult to use. Even after a week of using the WS60, I found myself making mistakes entering data using the number pad because of the shrunken key size. Unlike enterprise-grade workstations like the Lenovo ThinkPad T450s, the W550s, and the W540 and W541, MSI doesn't offer a spill-resistant keyboard. The ThinkPad keyboard comes with channels that drain underneath the laptop, a convenient feature for accident-prone mobile users who work on cramped cafe tables.